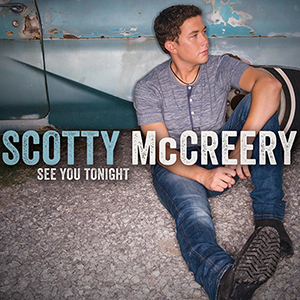 The top 5 albums on this week’s Top 10 Country Albums chart includes three new entries with Scotty McCreery’s “See You Tonight Leading the way with 52k copies sold. That was 9,000 more than Willie Nelson’s “To All The Girls…” duets album, one of Willie’s best weeks ever, not bad for an 80 year old ‘classic artist.’ He proves great concepts (duets album with top stars) still help move the needle. Luke Bryan’s “Crash My Party” Sits at #3 this week with 25k more albums added to his tally while rising star Chase Rice debuts in the Top 5 for the first time ever with his EP “Ready Set Roll.” Last week’s #1 album, Cassadee Pope’s “Frame By Frame” rounds out the Top 5 this week with sales now at 59k in two weeks. Florida Georgia Line and Alan Jackson lead second half of Top 10 (which Blake Shelton’s “Based On A True Story” drops out of for the first time since being released 30 weeks ago). FGL move another 14k of the standard version of “Here’s To The Good Times” with their ‘deluxe edition scheduled to hit stores in a few weeks. Alan Jackson’s “The Bluegrass Album” gains sales to bring sales to 54k to date for the release which features not one radio hit. Meanwhile Justin Moore’s month old “Off The Beaten Path” has now sold 157k to date, just 20k less than the week older “Fuse” from Keith Urban. Jason Aldean’s “Night Train” jumps back to the Top 10 with a 13% sales increase to bring sales totals to 1.454 million sold in 53 weeks on the charts. Chris Young, Taylor Swift, Hunter Hayes and The Band Perry Lead Notables. Joey+Rory Debut with Made To Last album. Chris Young’s “A.M.” now has sold 95k to date while Tyler Farr’s “Redneck Crazy” has sold 45k to date. Joe Nichols’ “Crickets has sold 22k in two weeks while Kenny Rogers has moved 13k for “You Can’t MAke Old Friends” in two weeks on the charts. Finally, Will Hoge’s “Never Give In” debuts with over 3k sold.